Have you ever encountered a puzzle in a game that utterly stumped you, then wondered why it seemed so trivially easy when you stepped away and came back to it after doing something else for a while? I have, especially on a recent playthrough of an indie puzzle game called “QUBE” (http://qube-game.com/). 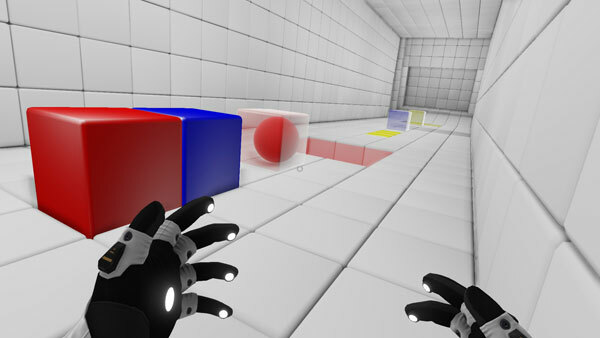 For those not familiar, QUBE is a first person puzzle game (kind of like Portal) where you manipulate special blocks in the environment to solve puzzles and exit testing chambers. 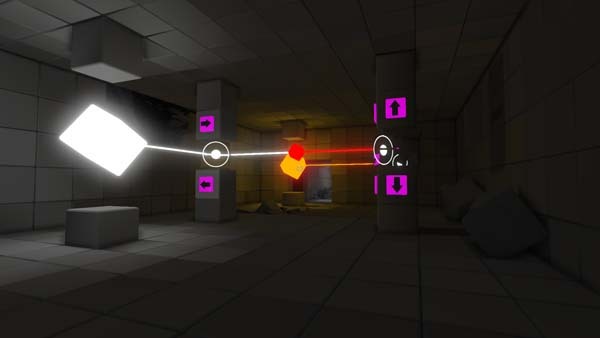 Different colored blocks do different things, and once you enter a room where multiple blocks come into play, the puzzles can get really tricky and require some real insight to solve. For example, in one area you cause a clear globe to roll down a slope towards a purple receptacle, and when the ball passes through a blue field it turns blue. The insight needed to solve the puzzle is that you need to get the ball to roll first through a red field, then a blue field so that it turns purple (red + blue = purple) to match the purple receptacle at the bottom of the slope. I found some of the puzzles in the final stages of QUBE devilishly difficult because they constantly required you to combine the different game mechanics in new and unprecedented ways. The solutions seemed obvious in hindsight but I simply did not see them at all prior that “ah-ha!” moment. That’s the hallmark of a good puzzle game, but upon getting stumped in games like these, people (myself included) will often immediately head to GameFaqs or YouTube to find the solution so they can get on with things. But QUBE doesn’t even have a story or any other kind of gameplay. The sole point of the game is to solve the puzzles, so I didn’t want to cheat. Instead I was reminded that when faced with a difficult problem requiring a creative insight we are often greatly aided by stepping away and doing something relaxing for a while instead of trying to brute force things and keep staring the puzzle down until we figure it out. The insight needed for the solution then often comes to us in the midst of a hot shower, during a relaxing walk, or in the moments right before we drift off to sleep. Adopting this strategy, I stepped away when stumped and eventually finished the game. Weeks later I was reading Jonah Lehrer’s new book Imagine: How Creativity Works and discovered that psychologists have extensively studied this phenomenon and actually honed in on the neuroscience of it a bit. Lehrer cites a study by Simone Sandkuhler and Joydeep Bhattacharya where the researchers used electroencephalography (EEG) to measure the brain activity of subjects trying to solve riddles. They found that a reliable indicator of when someone was about to figure out a puzzle was a steady rhythm of alpha waves from parts of the brain associated with relaxation and free association, and much less activity from areas of the brain associated with attention and focussed thought. When people lacked sufficient alpha waves, they were less likely to solve the riddles, even when given overt clues. I don’t understand. I keep doing the same thing and not getting a different result. Lehrer argues in his book that this is an illustration of how different parts of our brain work –or don’t work– when it comes to creativity and problem solving. Creative insights come about when our minds can wander in a way that lets them to break free of assumptions and constraints to create unprecedented combinations of concepts. This results in the pattern of alpha waves cited in the above study. As such, highly focussed effort and attention are actually the bane of creative problem solving, since they activate parts of our brain like the prefrontal cortex that overemphasize what we think we know and censor possibilities simply on the grounds that they’re weird or supposedly outside the context of the problem. Too much focus can be a bad thing. Move any single line from the expression below to make it true. Many of you probably see that the answer is to simply move the “I” from the left of the “V” to the right of the “V” to make “VI = III + III” or “6 = 3 + 3.” More than 90% of the subjects got that one, similar to a group of control subjects without brain injuries. 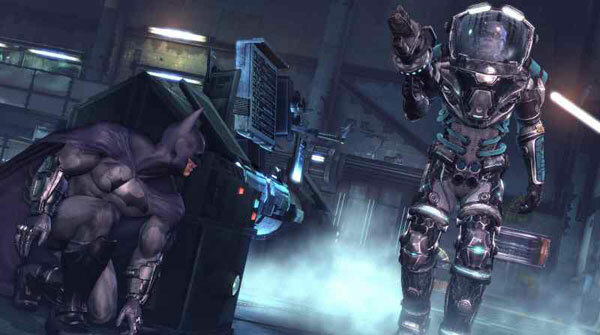 Remember how creative you had to get in Batman Arkham City’s Mr. Freeze boss fight? And so it is with games like QUBE and games of its ilk. In one of the later levels the solution to a puzzle (spoiler alert!) where you shuffle blocks around in a glass-covered pit requires you to realize that you can manipulate the blocks in such a way that one of them gets launched up at the glass cover to shatter it and completely change the rules of that puzzle. And it’s not just puzzle games like QUBE or Portal. It could be a Zelda game where you have to figure out how to beat an end dungeon boss, an RPG where you load out different stats and abilities, a strategy game where you try different build orders, or a combat game where you try different weapons and loadouts. Relaxation and shoving your attention somewhere else are likely to help because of the different parts of the brain that they activate. So next time you’re stuck, don’t go straight to GameFAQs. Take a walk, play with your dog, fold some laundry, or do anything else that lets you mind wander. Or I suppose you could try getting brain damage. Apparently that works, too. And yeah, lest someone else bring it up first I’m familiar with Lehrer’s disgraced status on account of fabricating quotes and quoting himself in the book. Heck, you can’t even currently buy the book new as far as I know since his publisher pulled it. I think the point still stands, though, and I did track down and read the two original studies discussed above. If a game detects that you are fumbling with a puzzle and have spent quite a lot of time with no results, could it distract you in any way and manage to increase your alpha waves? Or is it necessary to do something completely different? That’s an interesting idea, maybe there could be something there if the game allowed you to tackle some other easier task or activity for a while. But from what I understand you need to really relax and do something that doesn’t require much focus or attention on anything. It’s about relaxing the part of your brain that acts as a censor and directs your thoughts, not about the specific subject of the thoughts. I see. It would probably break the flow if the game suddenly showed a picture of sandy beaches and started playing the latest Pan Pipe Moods album, just because I spent too much time on a puzzle. So, activities like the free roaming and taxi driving in GTA 3 could possibly make you relax a bit? They don’t require much thought effort and are somewhat different from the missions. That would make a pretty interesting experiment to find out, yep. All of this also probably fits with the fact that I am always at my best with games like this, or any creative endevour really, very late at night (1-2am or later), in a quiet house when I’m probably slightly tired. I couldn’t get anywhere at one point in Braid until I had an insomnia attack, got out of bed and started playing it at about 3am, and got through a huge amount of levels and finished it all in one go. Dude, this site is brilliant. I’ve been trawling the internet for an article such as this one for years now. You make some super salient points, and I honestly could not agree with you more. Keep it up – this kind of intellectual discussion NEEDS to happen to make sure people make good games that enrich people’s lives, and stop becoming just commodities for making truckloads of money. You’ve gained a regular reader. I rotated the first I in the equation so that it created a V instead of rotating the plus sign… does that count?